Not sure if this is the peptide booster or a combination of my whole routine (which also includes vitamin C booster), but my skin looks much better! The dullness has almost disappeared, I don't look so tired in the mornings, and it feels that it gives me an extra hydration which is something I really need with my skin prone to redness. I am very happy with the product, though it is rather expensive but feels like it's worth it! I received a sample of this with another order. I used it as part of my evening routine and could not believe how "fresh faced" I looked the following morning! (I am 44) smooth skin, and my eyes - well I guess I looked at least 5 years younger!! instantly ordered the full size bottle and have been using it for 2 weeks and I love it. I really don't write reviews but this one deserves it. Aimee - Made me actually write a review!! Really impressed. I have sensitive skin and this has caused no problems infact serum seems to have calmed some of my redness. Fine lines and frown mark have faded a little after one week of use. Incredible change to my elderly and drug (medical!) harassed skin huge improvement in structure - feels firm underpinned and soft - marionette lines around mouth almost gone - thank you Paula amazing stuff ! The Peptide Booster samples from my last order arrived, I’ve been using it for several days and I’m delighted with the product. I’ve ordered the full-size bottle today. The sample size is 1ml, I’ve used about half that (0.5ml) after cleansing, toning and exfoliating (using a BHA) my skin in the morning and at night. It’s light, absorbs quickly and replenishes without heaviness. Following with the same amount (0.5ml) of Paula’s Hyaluronic Acid Booster in the morning, my skin is perfectly moisturised and ready for my mineral sunscreen. This impressed me most – the booster gave me a better base for my sunscreen. Even the best mineral sunscreens can sometimes feel drying upon application. At night, I’ve followed the booster application with either Calm Lightweight Restoring Cream Moisturiser or Calm Restoring Moisturiser depending upon how dry my skin feels. Amazing what 0.5mls of the Peptide Booster achieves. I couldn’t be happier. My skin care routine is made up of Paula’s Choice products. As I’ve aged, my skin is less resilient and prone to redness if I use too much product(s), fail to cleanse or exfoliate (BHA) properly, neglect applying a mineral sunscreen regardless of weather conditions or use anything fragrant on my face. 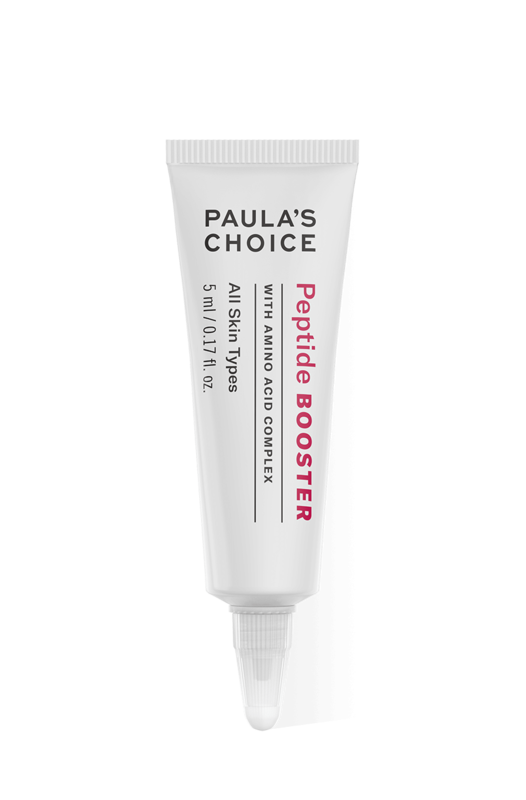 Overall, it’s less expensive and easier relying on Paula’s Choice products. Customer Care: Hi Jenny, thank you for sharing your experience with us, we are happy to hear you love the Peptide Booster as much as we do!